SportsLine's projection model simulated Virginia Tech vs. Liberty 10,000 times. The Virginia Tech Hokies won their first NCAA Tournament game in 12 years by cruising past St. Louis 66-52 on Friday. But now the No. 4 seed in the East gets an upstart looking for another big upset win, the No. 12 Liberty Flames, in an intriguing second-round game tipping on Sunday at 7:10 p.m. ET in San Jose. Liberty (29-6) got past No. 5 seed Mississippi State 80-76 on Friday for its first-ever win in the Big Dance, one of three No. 12 seeds to advance to the second round. The latest Virginia Tech vs. Liberty odds have the Hokies favored by nine points, with the over-under, or total points Vegas thinks will be scored, at 126.5. It's the red-hot automatic qualifier from the Atlantic Sun against the battle-tested No. 5 team from ACC, so before locking in any Virginia Tech vs. Liberty picks of your own, you'll want to check out the 2019 NCAA Tournament predictions from the SportsLine Projection Model. Now it has analyzed all relevant data and crunched the numbers for Virginia Tech vs. Liberty. We can tell you it's leaning over, but it also has a strong point-spread pick that hits in well over 50 percent of simulations. That pick is only available at SportsLine. Tech was boosted by the return of starting point guard Justin Robinson in the first round. After missing 12 games (foot), Robinson scored nine points off the bench, sparking a key run. He adds a needed third dimension of scoring to go along with standouts Nickeil Alexander-Walker (16.7 ppg) and Kerry Blackshear (14.7). Those two combined for 35 points Friday. Tech's defense, ranking 11th in the nation allowing 61.8, has remained steady and dominant. Before Liberty's impressive win over Mississippi State, the Flames were 1-3 against major-conference teams, beating UCLA by 15 while losing to Vanderbilt, Alabama and Georgetown each by 9-10 points. Tech's season includes wins over Duke, Purdue, Washington and Syracuse. Plus, these teams have seen each other on the court this season -- they played a preseason exhibition on the Liberty campus to benefit hurricane relief efforts, a game Tech won 86-70. But just because the Hokies cruised Friday and are finally healthy doesn't mean they can cover the Virginia Tech vs. Liberty spread. As good as Virginia Tech's defense has been, Liberty's has been just as good, allowing a scant 61.2 points per game, ninth in Division I. On Friday, the Flames showed they can score points too, putting up 80 on Mississippi State. Liberty junior guard Caleb Homesley went off for a career-high 30, including 14 in the final seven minutes to spark a rally. Flames leading scorer Scottie James managed only six points against the Bulldogs, the first time in nearly two months he'd been held to single-digits, but he's averaging 12.9 for the season. Against the spread, Liberty has covered in five straight versus teams like Virginia Tech that have winning percentages above .600. The Hokies, meanwhile, have covered just once in their last five NCAA Tournament games. Who wins Liberty vs. Virginia Tech? And which side of the spread hits in well over 50 percent of simulations? 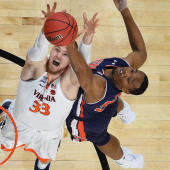 Visit SportsLine now to find out which side of the Liberty vs. Virginia Tech spread you need to jump on, all from the model that has crushed college hoops, and find out.